If you were to visualize a perfect getaway in the mountains, you have just realized your dreams with Holly Cabin. Privately tucked away in the mountains surrounding the world renown town of Stowe, Vermont...ski capital of the East. LIFE Magazine put Stowe on its list of 100 places to visit during your life. Though Holly Cabin is situated on more than 10 acres, with a trout stream and swimming pond, and crystal clear water, it is only minutes from Stowe Village. 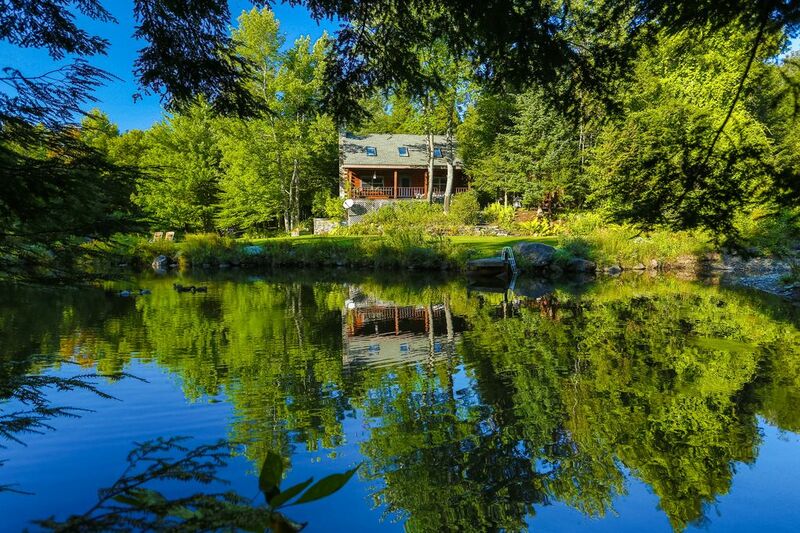 This property is as perfect as Vermont is beautiful. This location is a child's fantasy come to life. Feeding the pet ducks, feeding the trout, fishing, tubing, swimming, boating and running barefoot on a large manicured lawn...all in complete privacy. For adults, here is a place to relax and renew your spirit. For families, a place to totally enjoy being together. Small well-mannered dogs considered. Please inquire before booking. *** Please see the owners website link for more photos & cabin information at hollycabin on Google. Two porches; 1 with swing and furniture, 1 with sofa and chairs plus a large picnic table. Large lawn and swimming pond with crystal clear water and trout. Porches are perfect for reading, relaxing and snoozing. Washing machine and dryer are downstairs. Guess 1 word says it all...PERFECT. Holly was extremely helpful answering every question we had very quickly (from booking through our stay). The house is quaint, quiet, and a wonderful retreat... close to skiing and Stowe, yet feels like you are on your own mountain. The house was warm charming and spacious. The grand room on the main floor w fireplace and dining table was a perfect setting to unwind and have dinner after a day on the slopes. The basement pool table/ TV room was a great bonus as well as the outdoor hot tub. Everything was clean, worked well and it was a very easy process dealing with Holly. We hope to be back for summer. This cabin was all it said and more!! My security deposit is usually 300.00, not 1,000, as stated by Home Away.